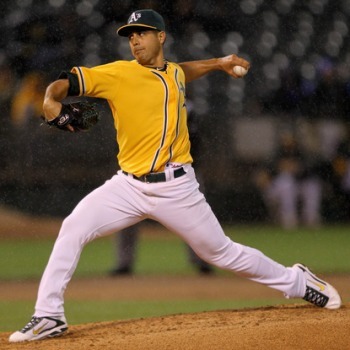 Never trade for one of the Oakland A's pitchers. 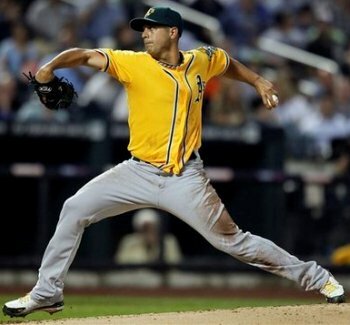 The reason why people say that is because the A's have an uncanny -- or something -- ability to trade pitchers away right before they fall apart. 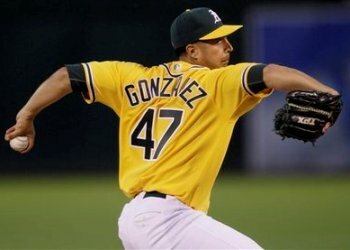 That was true for Barry Zito, Mark Mulder, and Rich Harden and it's true of Gio Gonzalez. But why would that be true if Gio Gonzalez hasn't had any problems with injuries and hasn't shown any velocity or control problems? Let me explain what I see and why it concerns me. 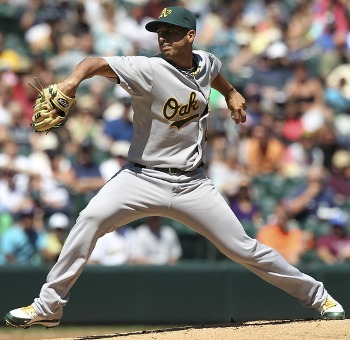 In sum, what I see is our old friend the Inverted W.
The thing to notice is how Gio Gonzalez's elbow gets much higher than his hand, especially in the picture directly above. Of course, the thing to remember about the Inverted W is that it isn't 100% fatal; the Inverted W is only really dangerous if it creates a timing problem and if the pitcher throws harder than average. 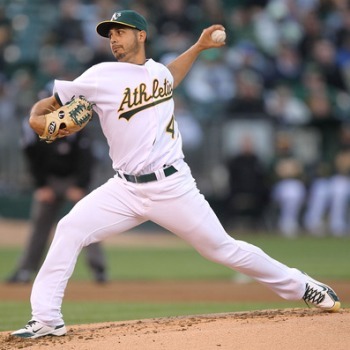 Unfortunately for Gio Gonzalez, and for the Nationals, it's quite easy to find pictures of Gio Gonzalez that show evidence of a timing problem; that show his arm in a horizontal position when his front foot plants and his shoulders start to rotate. Speaking of the Nationals, it's curious that they now have at least 3 starting pitchers with problematic pitching mechanics in general and Inverted W's in particular. Given that Stephen Strasburg, Jordan Zimmermann, and Gio Gonzalez all have Inverted W's, you have to wonder if, like the Blue Jays, the Nats are either scouting for the Inverted W and/or don't believe it's problematic. However, I would be concerned if I was a Nats fan. I could see their pitchers having a decent 2012, but I could see the wheels falling off of all 3 of their top pitchers starting in 2013 (and as happened to the Cubs with Mark Prior and Kerry Wood). If the Nats want to win, they probably need to do it in 2012.